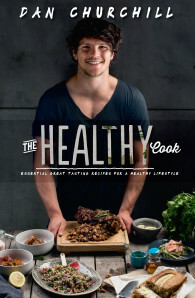 The Healthy Cook proves that healthy cooking doesn’t need to be boring. It features an array of amazing cuisines, all colourful, delicious and nutritious. The Healthy Cook is set to revolutionise the way you look at healthy cooking, being one of the first cookbooks to provide the macronutrient (Proteins, Fats and Carbohydrates) information for each meal, all in a simple table. Readers will learn about what they are actually digesting just from a quick glance, providing an efficient and easy way to understand how balanced your meals really are. The book also incorporates the use of an easy to read slide bar including the aspects of time, skill and health, providing an easy guide to whether the recipe is right for tonight’s dinner. Being healthy is a lifestyle choice, and the recipes in The Healthy Cook prove it doesn’t mean you have to sacrifice great taste. Dan Churchill is a cook, author, physical trainer, and speaker. In 2013, he appeared on MasterChef Australia, which aired in more than ninety countries. His recipes have since been featured in publications like Men’s Health, Women’s Fitness, and on websites like PopSugar and Lululemon’s blog. Churchill has a bachelor’s degree in Sport and Exercise Management, and a master’s in Exercise Science (Strength & Conditioning). He speaks on a number of food and health-related topics and consults for athletes and sports teams worldwide to help optimize their performance through nutrition.